Crabs live all over the world, and the number of crab species in existence reaches about 4500. Those that are edible have strong followings all over the world such as the Stone Crab, Dungeness Crab, King Crab, and Blue Crab. Here in New England, we focus on the Jonah Crab which is medium-sized and contains some of the sweetest meat around. The Jonah Crab's habitat stretches from the icy waters of Northeastern Canada all the way down to the Carolinas. The majority of its landings are in Prince Edward Island, Maine, and Rhode Island. In the past, these crabs were discarded as a by-catch of lobstering. Once the demand for the crabs increased, a devoted fishery was created. The harvesters began to catch the crabs in increased numbers using baited pots as they did in fishing lobsters. These ready to eat morsels are comprised of just the claw with the ‘cap’ or base of the claw removed. The top of the claw, where the pincers are, is kept on to maintain the structure of the meat. These are most commonly served on their own with cocktail sauce or an aioli. Like the cap off claws but more of the shell is removed leaving just one pincer on for an elegant display. These are often served on their own or even as a part of an impressive shellfish tower. These include the whole arm with slits scored into the shell for you pop them open yourself. Some of the best meat is in those arm sections! These are served their own, or can be used as toppers to large bowls of shellfish stew. This is exactly what it sounds like, meat from the legs of the crab. This is picked from the shell by way of meticulous hand picking or via air hoses that force the meat out. This is the best option for elegant garnishes or as additions to pastas. Combo Meat: 60% body meat and 40% leg meat. The meat that comes from the body in smaller pieces and is either picked by hand or processed by machine which is mixed with large chunks from the legs. This is perfect for fillings and crab cakes. Since both fresh and frozen crab are available on the market, what is the difference between the two? First, we need to go into what happens to the meat (apart from the shell) during the freezing process. Crab muscle structure is a lot like ours with bands of filaments held together by proteins. These proteins allow the muscle to move by sliding over one another powered by the enzymes actin and myosin. Think of actin and myosin as lubricants that help the muscle filaments slide over each other. When muscles freeze, they will expand, pulling apart the filaments and denaturing the actin first and then the myosin. When the meat thaws, the muscle will contract again, but the denatured enzymes will leak out of the muscle fibers as they are not able to adhere to anything. Without the aid of the enzymes, the meat will appear to be drier thawed versus frozen. Crab in the shell is frozen with the aid of a glaze, which is a layer of ultra-cooled water that freezes on contact. This protects the meat and allows the crab to thaw quickly and evenly. Crab out of the shell is frozen in small batches in their own containers. Thawing should take place slowly in a fridge overnight. 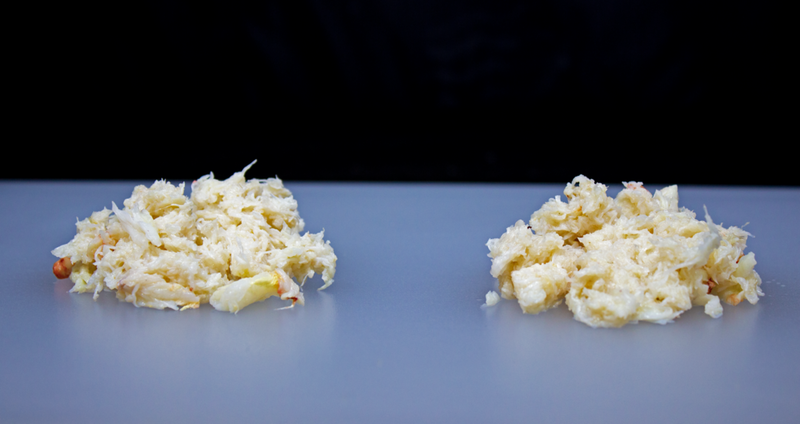 If the thawing process is rushed, the crab can lose more moisture creating an almost rubbery texture. There will still be some moisture loss, but not as much if the crab was not glazed. An untrained eye may not be able to detect much of a change as this reaction is slight and the muscle fibers of the crab are not as compact as other animals (shown side-by-side below). To the connoisseur, frozen is a different game than fresh, but both have a prominent place in crab-loving dishes. For fresh crab, it is best used in cold applications and areas where the crab will be served as the highlight of the dish. Being able to bite into a large, sweet, moist chunk of crab is a delight and it should be the freshest and brightest texture of all. Some examples of classic uses include Crab Louis salad, with fresh pasta, or as a garnish to a crab bisque. For frozen, it is best used in fillings, cakes, and other hot preparations. The addition of other ingredients will help some of the meat’s natural sweetness come through, and the meat’s drier texture will help in the binding process (just make sure it is well drained first!). As for fresh or frozen claws, both can be consumed in the same way without much of a difference in taste, but the fresh will be sweeter. The advantage of using frozen is that you can depend on a long shelf life and have them at the ready. Just make sure you give them the time they need to thaw properly. Looking to branch out into crab? Call us for products available and our ordering schedule.